Carla Scaletti is playing sounds on the Kyma sound design workstation with a Wiimote. This video can be found in a larger and much better quality here . In Live, open the Preferences, go to “MIDI Sync” tab and enable the Track and Remote columns for “OSCulator Out” and “OSCulator In” interfaces. This will enable us to record events and send control events to OSCulator as well. Now, launch TouchOSC on your iPhone. Please make sure you have latest version installed. Click on the “Done” button and leave TouchOSC running. From there, we can either load a template or configure OSCulator manually. If you prefer to “plug and play” with MIDI, just use the template corresponding to the layou you chose (Beatmachine in our case). It is located in the Sample Patches folder of the OSCulator folder you installed on your computer. Once you’ve loaded a template file, click on the Parameters button on the toolbar and go to the OSC Hosts tab. Set the “Default Host” to the one corresponding to your iPhone (it should read ‘TouchOSC’ in the name). You can also learn how to make such a template by reading what’s following. 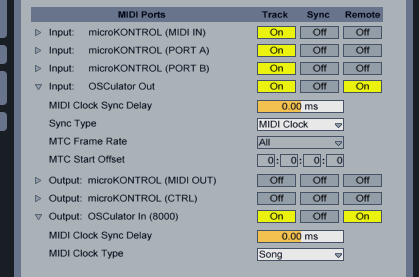 In OSCulator, select “MIDI CC” as Event Type, and “0″ as Value (well, the first value in the list). Now, let’s tell Live we want to use this MIDI control change to control the volume fader of the first track. This procedure also works for any button or control in Live.